Prices include one color design silk screened on one side. Add a $40.00 screen charge. Balloon colors are red, white, light blue, royal blue, orange, pink, green, teal, black and yellow. Production time is two or three days. Average float time: 8 to 10 hours for nine inch and 12 to 14 hours for eleven inch helium filled balloons. For a two color imprint add another $40.00 screen charge and a running charge of 3 cents per balloon. The minimum order for two color imprinting is 1000 balloons. The pricing includes a one color imprint silk screened on one side. Add a $40.00 screen charge per color per side. There is a 250 balloon minimum for a two color or second side imprint. Imprint area: 11" diameter for round balloons and 10" diameter for heart or star balloons. Average float time is 4 to 6 days. For extra colors add 30 cents per balloon per extra color plus a $40.00 screen charge per extra color. 250 balloon minimum for 2 color imprint. 1000 balloon minimum for 3 or 4 color imprint. Star shaped foil balloons available in purple, blue, white, red, gold and silver. Heart shaped foil balloons available in all of those plus pink and pastel pink. 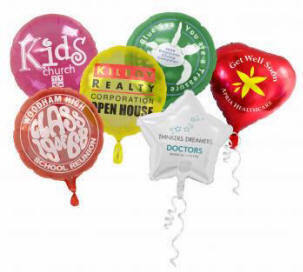 Round shaped foil balloons available in all of those plus black, green, yellow, burgundy, orange, navy and lime green.